Gyroscopes, accelerometers and motion sensors, like the Segway scooter. 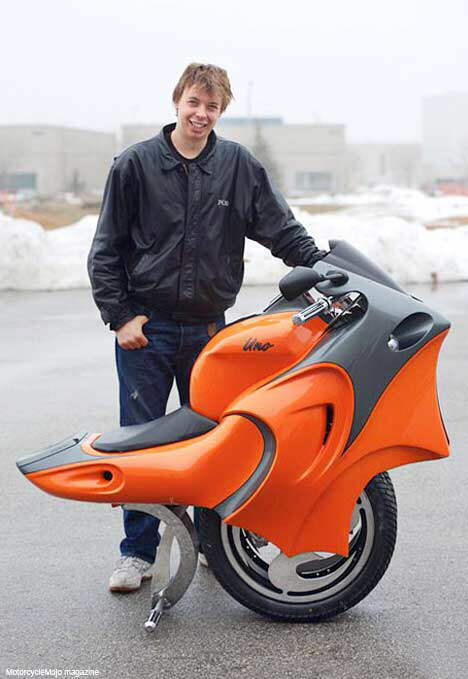 young inventor has created a motorbike with a twist -- it uses two wheels but they are positioned right next to each other, giving it the illusion of being a powered unicycle. Andeven better, it might help save the planet. 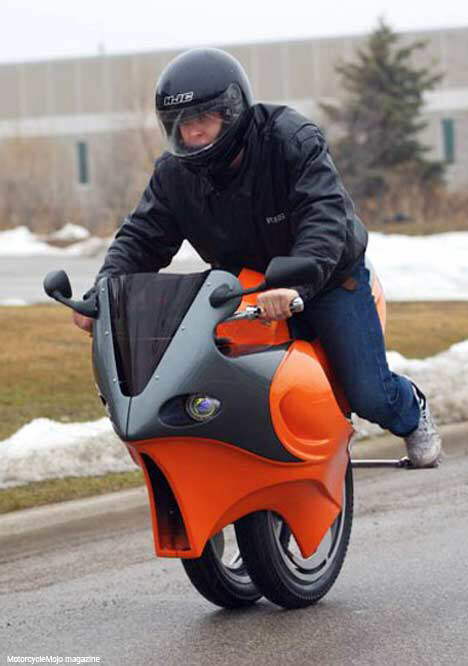 Ben Gulak has spent several years building the electric Uno that uses gyroscopic technology -- like the infamous Segway commuter device -- to stay upright. The bizarre-looking contraption has only one switch -- on or off -- and is controlled entirely by body movement. The rider leans forwards to accelerate to speeds of 25 mph and back to slow down. It has two wheels side-by-side and has been turning heads wherever it has been ridden. The green machine is so small and light it can be taken indoors and carried into lifts -- and is recharged by being plugged into the mains. The wheels are completely independent, allowing the bike to turn on a sixpence and the technology takes the balance and guesswork out of riding a unicycle. Its 18-year-old creator is now looking for investors to get the Uno into production and onto the streets. Ben, from Ontario , Canada , said: 'I was inspired to make the bike after visiting China a few years ago and seeing all the smog. 'They all drive little bikes that are really polluting and I wanted to make something to combat that. 'I started with the concept because if something doesn't look cool people just won't be interested. Ben Gulak turns heads from onlookers as he rides past them. After coming up with the concept I started tobuild it and now have the first prototype and the reaction has been amazing. 'It has two wheels side by side and that means it is easier to turn as they are completely independent and have their own suspension. 'The bike has a 'neutral point' and when you lean forward it accelerates to keep the neutral point in the right place. 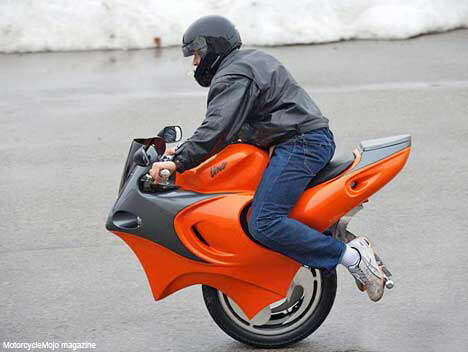 'It has a couple of gyros and is basically self-balancing -- it takes the guesswork out of riding a unicycle. 'The bike takes a bit of getting used to because you have to learn to trust it. But it doesn't take long.' It takes any weight and weighs 120 lbs and can fit into a lift so you can take it indoors to charge it up. 'Currently it has a top speed of 25 mph, but that will be increased greatly with bigger motors.' It has a range of about 2.5 hours and it is designed for the commute to work through busy towns. I believe this could be electrical alternative to the car.